I was talking with members of one of my writers’ groups during a meetup based on blogs. Somewhere along the line, I got to talking about dogs, and it was suggested I write about dogs for my next blog post (thanks, Marie!). This was a great idea, especially since I had earlier mentioned having a hard time coming up with topics upon which to write. Doing all of the advocacy I do for animals, I know I shouldn’t probably have favorites, but I can’t help it; I’m a dog person. As far as I can recall, I always have been. I can’t relate to cats (and I’m allergic to them anyway), but the way dogs show they love and need your companionship, return all that back to you, are so expressive, and have such loyalty draws me in. I am an extremely loyal person myself (to a fault), and I’ve been hurt by that fact in my life, most recently by my ex-wife (but we don’t need to go there). Of course I highly regard what is arguably the most loyal creature on the planet. I advocate for cats as well, but my heart is with canis familiaris. The conversation I was having during my meetup centered around what we, as people, have done to make dogs the creatures we know. At no point did golden retrievers and chihuahuas occur in the wild. We made these breeds over approximately 15,000 years as man domesticated wolves, or wolves entered into a partnership with us. The theory is that wolves got closer and closer to our ancestors’ encampments to feed off our scraps, perhaps gain warmth near our fires, and our ancestors saw the benefit in having protectors and mobile “alarm systems” hanging around. Domestication was inevitable. Why don’t the majority of today’s breeds resemble wolves? I refer to an article I read in National Geographic (Taming the Wild, March 2011) which covered the story of a Russian geneticist doing research on foxes in the 60’s. The most fierce and volatile-tempered of the foxes were bred with ones of similar temperament, and the most docile were bred with other docile ones. There were also control groups bred from mixed temperaments. After 9 generations (9 years), the ones bred strictly from volatiles were nasty little demons, but the ones bred from only docile parents began to develop patterned coats (the original generation’s just being grey), and had their ears stay droopy longer before standing upright as adult fox ears do. They would also wag their tails and lick the geneticists’ faces. By the 13th generation (13 years), they had tails which curled upwards upon seeing humans. Still later generations of the foxes would include red and chestnut colored fur. People react to puppy dog eyes and floppy ears, and pretty much every breed of puppy dog has ears and eyes that do that. People also respond to different colors and patterns and curly tails. The hypothesis? It’s an evolutionary trait that developed to make us go “Oooh and Aaahhh” when we see them, and we want to take in these adorable little furballs. So the foxes started retaining their droopy ears longer and developing different patterns, and sometimes more vibrant colors. They even started whining when the handlers came by their cages while the aggressive ones snarled and threatened menacingly. Some “nice ones” would even jump up into the humans’ arms. All within 15 generations, or 15 years of selective breeding. So, different traits would change with wolves as they became more and more domesticated, and as different jobs were created for them, such as guarding, herding, or hunting. Then we cross-bred different emerging subclasses with others to get newer combinations of appearance, size, personality, and function. 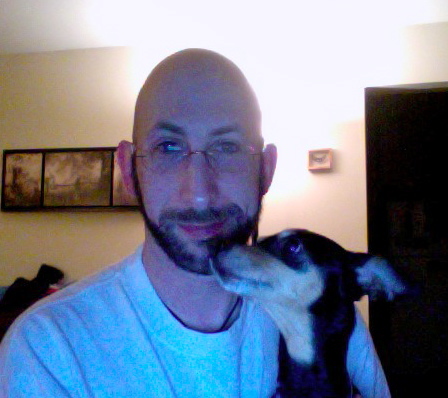 My own dog is believed to be a rat terrier/miniature pinscher mix. Both breeds were designed to be vermin hunters, and are smaller in stature, but possessing a very strong prey drive. 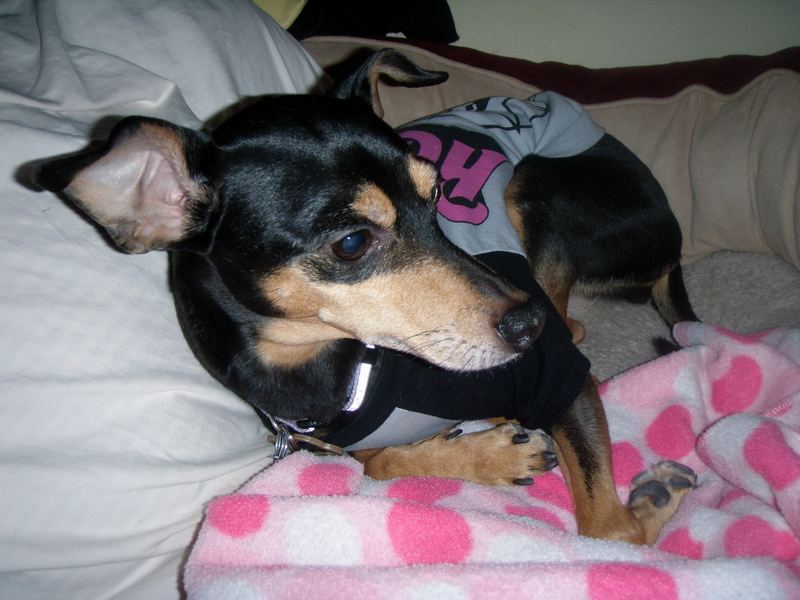 The miniature pinscher was created by mixing the German pinscher with the Italian greyhound and dachshund in all probability, and the rat terrier was likely created by mixing various terrier breeds. So my Furgii is an amalgamation of generations of specifically designed breeding for specific purposes. The downside to all of this is that so many of us want “purebred” dogs, such as the different retriever breeds or Yorkshire terriers or mastiffs. But breeding “like with like” too closely will eventually cause a degradation of the health of the breed if genetic lines are bred with themselves. The fact is that most breeders in the world are not of the careful or responsible kind, and are just mass producing dogs for a bottom line return. They don’t remove unhealthy ones from the breeding lines. Hence we have breeds that are likely to have ailments such as hip dysplasia, cataracts, heart conditions, patellar problems, and so on. It’s just like human genetics. Those of Jewish decent are at risk for Tae-Sacs, and African Americans for sickle cell anemia, while the child of a half Caucasian/half African American parent and half Latino/half Asian parent will have a significantly greater chance of being healthy, and would probably have phenomenal skin, too. It’s the same for dogs (and other creatures, of course). A mutt can still have been bred from poor genetic stock along the way, but mathematically should have the best chances of escaping these unwanted traits by dilution. Wild animals, by the way, generally seem to know not to mate incestuously for these reasons. It’s evolutionary survival not to to do so. But long story, short, this is how we got dogs from wolves. 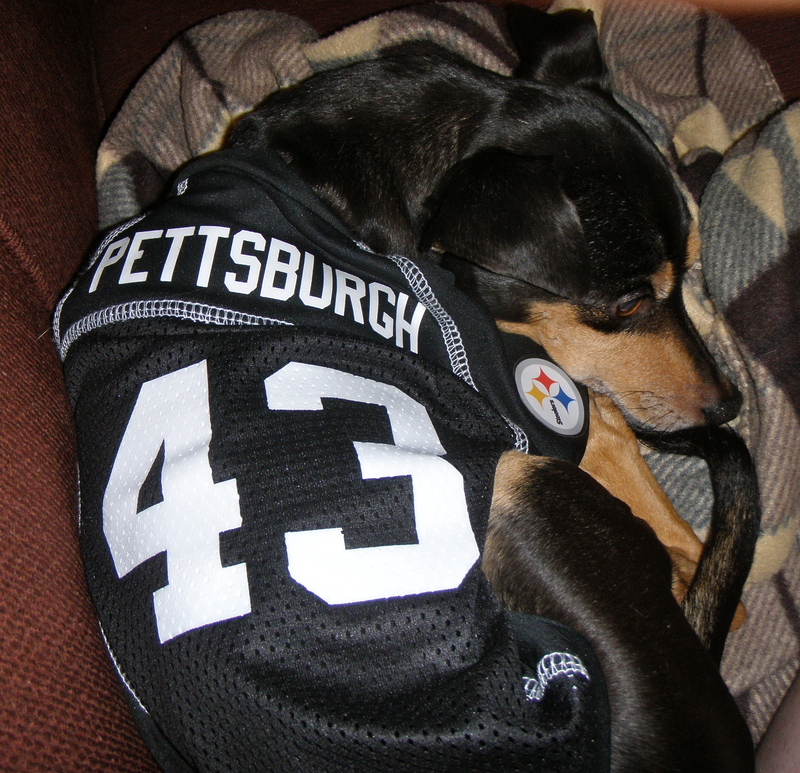 Now, I ultimately don’t know where my long-since-descended-from-wolves rat terrier/min pin (rat pin?) Furgii came from, who bred her, or why. She was found wandering around North Carolina and was in a rescue for 6 months before I adopted her. What I CAN tell you is that there’s nothing you could offer me which I would accept in trade for her. Nothing. And that takes me to the point I really want to make: You could go to a breeder, even a reputable one, to get the breed of your dreams or even, as many people want, the puppy of your dreams. But there are so many dogs that are being killed in shelters every damn day because no one wants them. They were abandoned; they got lost; they “no longer fit into the family’s plans”; they were dumped at the shelter after getting chewed up as a bait dog in a dog fighting ring. Some of these dogs just need a new family, are just victims of circumstance, and some need to receive love for the first time in their lives. They’re out there waiting. Waiting for someone who wants a dog, like you. So please, if you’re looking for a dog, check the shelters, check the rescues. As the slogan says, “Rescued is MY favorite breed”. This entry was posted in Uncategorized and tagged activism, activist, adopt, advocacy, advocate, animal, animal adoption, animal advocacy, animal rescue, animal rights, animals, breed, breeder, breeding, canine, cats, dog, dog fighting, dog person, dogs, domestic animals, domestic foxes, domesticastion, fox, foxes, genetics, min pin, miniature pinscher, neglect cases, philosophy, puppies, puppy, puppy mill, puppy mills, Rat terrier, rescue, rescued is my favorite breed, save, saved, shelter, shelter dog, stray, stray dogs, strays, therapy, vet, veterinarian, veterinary. Excellent story and fun to read.